and to make pilgrimage plans based on the weather report. So I aim to reclaim the name Christian. To reclaim a life of perpetual resistance, and perfect obedience. And instead of waiting for fair weather, to run into darkness. Because that’s where shining makes a difference. And because that’s what Christians do. “Behold, a king shall reign in righteousness, and princes shall rule in judgment. 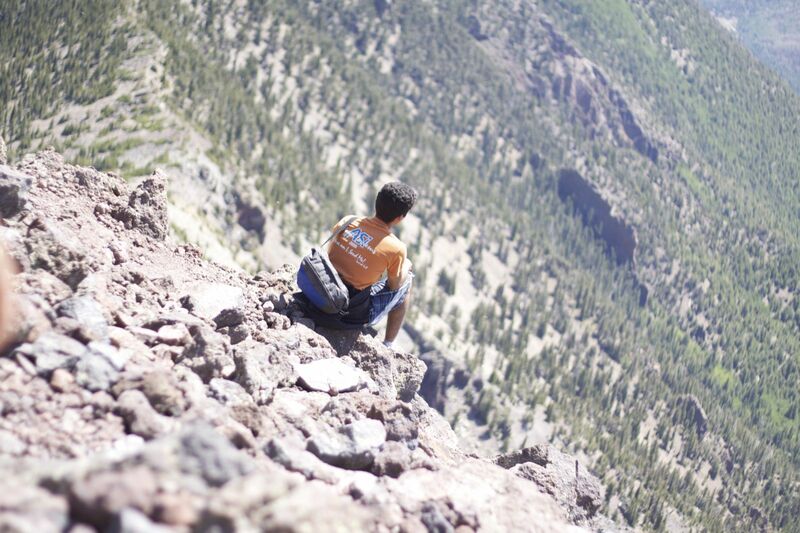 Above the timber line: looking down from Arizona’s tallest peak. Amen! May God help us to live for Him, to be His and only His and than we will be different, we will be shining and we will make a difference. Amen…I'm with you! May we be faithful to the call. Wow! When you first told me about this concept this morning, it caught my atttention. I never really thought about us ( Godly men and women) being a hiding place. No we often think of God and, God alone as holding this place. We hid or weekness and so on in him. But men? Wow! That leads me to my next question. Am I the kind of person God could use in that way? Do I reflect Him so much that a vessel of clay, like me, could be used to hid one of His earthly children in? That's a big idea. And an even bigger responsibility. But oh, something to reach higher for. Something to achieve. Amen… Thanks Sean!